New work by ADAM NEATE, RON ENGLISH and JOSE PARLA at the Elm Lesters Painting Rooms. THE EXHIBITION is bringing together three artists, two from New York and one from London.The title of the show directly relates to the nature of their work, as all three artists have made their transition from the street to the gallery; operating both inside and outside the system. 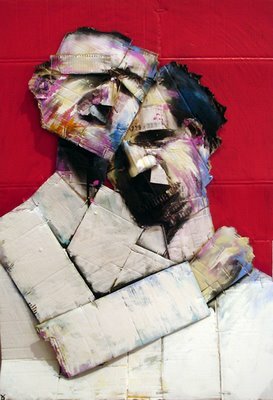 Each artist however has their own speciality; ADAM NEATE is famous for leaving his paintings on cardboard on the streets, RONENGLISH for hijacking billboards, and JOSE PARLA's work has evolved from his caligraphic experimental lettering on walls to powerful textured paintings which draw their inspiration from urban decay. powerful paintings by JOSE PARLA. Calling Jose Parla a graffiti artist would not be entirely off the wall. Sure, he uses spray paint and the distinctive lettering style found on underpasses and concrete walls — bubble lettering, bold perspective letters and the newer, enigmatic wildstyle. But Parla is more than just a graffiti artist, a moniker that perpetuates the supposed schism between "high" and "low" art. Instead, consider Parla a novelist with an unusual method of storytelling. Parla's images read like an urban travel history, incorporating the work of "writers" (aka street artists) that he experiences during his forays into various concrete jungles. Using aging techniques to suggest typical urban walls — painted on, written on, scribbled out, painted over, covered with handbills — Parla recreates a sense of place. Miami (where he was raised) and New York City (where he now lives) are featured destinations. Each urban space and the artwork it inspires is a product of prior travelers (taggers) whose indelible marks Parla may incorporate into his paintings. Yet sooner than Parla can capture the essence of a place, it has already changed: A new tagger has left his mark, obliterated the old, rewritten history... for the moment. Graffiti stories have no beginnings, no ends; they're never told the same way twice. This contextual irony (storytelling that isn't being read) isn't lost on Parla, who no doubt knows his Pop Art history. He knows all about Jean-Michel Basquiat, the tagger known as Samo. When Basquiat became Andy Warhol's prodigy, the art world went gonzo (while nonetheless remaining perplexed at Basquiat's scribbles and seemingly arbitrary markmaking). Also during the 1980's, Keith Haring was drawing chalk cartoons on the black paper covering subway advertising panels (technically defacing public property). He parlayed his designs into a thriving shop selling T-shirts while at the same time wowing the art world at the ultra-hip Tony Schafrazi Gallery and a variety of international Biennale exhibits. Similarly, Parla transforms and capitalizes on something that's often dismissed as not art-worthy. Graffiti is generally valued only to the degree that city leaders are willing to pay to stop it, cover it up and punish the people who put the images on their shiny new walls. Moreover, it's often considered vandalism by the same segment of the population who are now shelling out big bucks for Parla's artwork. More irony. As much as Parla tells the stories of others, he also tells his own story: born to a family of Cuban exiles in Miami, lived in Puerto Rico, then Miami, then traveled a lot. He went to art school in the '80s and now lives in New York. He began showing in the late '90s, frequently at the Modern Primitive gallery, and began to develop the concept of "segmented realities" or "memory documents" of his travels. Soon Parla was showing with masters like Lee Quinones and at locations throughout New York, including the reputable Chelsea Museum alongside European pioneer Mimmo Rotella, whose '60s-era style included working with graffiti and torn posters. Parla began exhibiting in Japan — where graffiti art is huge — as well as booking commercial gigs with folks like Nike. His custom-painted clothing commemorating Los Angeles-based shoe designer UNDFTD is featured in Juxtapoz magazine. His work has appeared in the Miami Herald, in the Atlanta Journal-Constitution and in Rolling Stone. And during the first week of October, Parla will be artist in residence at Whitworth College's Koehler Gallery. Associate Professor of Art Scott Kolbo, who directs the gallery and is a respected printmaker in his own right, deserves kudos for bringing a cutting-edge artist like Parla to Spokane. In addition to videos, photos, prints and paintings in the gallery, Parla will create a painting for Whitworth's permanent collection and teach a printing workshop (the proceeds of which will help fund future residencies). Kolbo's description of Parla's work as "expressionist" is spot-on. His colors are Arshile Gorky — deep reds, earth tones, black, muted grays — with aerosol blooms like Helen Frankenthaler, pale ochre and sky blue. Parla expresses an energy similar to Jackson Pollock's action paintings, including the element of the subconscious markmaking that informed them. Consider too Parla's exhibition title, "The Mystic Writing Pad," which derives from Freud's catalog of psychological terms. According to Freud, "The surface of the Mystic Pad is clear of writing and once more capable of receiving impressions ... If we imagine one hand writing upon the surface of the Mystic Writing Pad while another periodically raises its covering-sheet from the slab, we shall have a concrete representation of the way I tried to picture the functioning of the perceptual apparatus of our mind." Parla describes his work as "a contemporary palimpsest," referring to writing material, usually parchment, which has been used over and over, even after the original writing has been erased — a form of the mystic pad. For Parla, the creation of each painting documents the process of becoming: a story within (or on top of) a story, on top of another story, ad infinitum. Layers of reality frozen, like film cels, and released, recycled. Graffiti-like surfaces are not what they appear to be. There is more to them — and to Parla — than meets the eye.